This classic monogram is the perfect personalization for this cobalt blue growler. Add your hand crafted beer or wine and enjoy with friends. Leave it natural for an etched look. 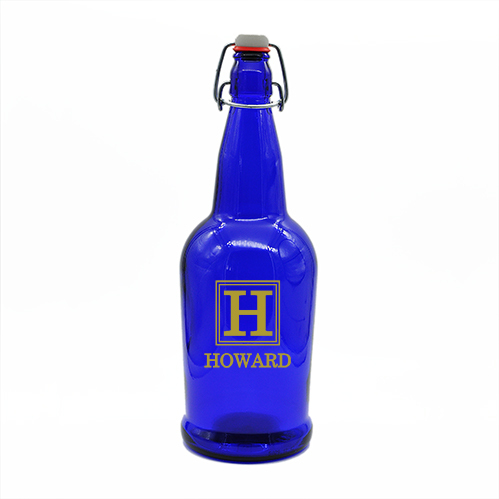 Your hand crafted beer is your pride and joy so what a better place to put it than in this custom monogram 1 liter cobalt blue growler. This growler comes with a durable swing top lid to keep freshness inside. Choose etched natural or one of our color fill options. Your friends and family will be as impressed with the content of the bottle as they are the growler itself. Simply add your personalization and we will do the rest. Order today!